Apologies for the lack of posts. I have been very busy with work ,but I still had managed to get a few sessions in. July has always a busy month both in work and fishing terms. Sometimes I have been taking the fishing gear and leaving straight from the job to hit the beach. I will try to sum up some the highlights that July had to offer. Having heard that some really big plaice had been caught in early July. I had a few sessions trying for them. After a couple of blanks. I managed to catch two small in one session. Disappointed I had gone plaice fishing and landed plaice but they were nowhere near the size that Gareth Griffiths had caught on one of his epic road trips. I also had wanted to have a bash at the big smoothound that have been caught along the Hampshire coast. With a bucket of Peeler me and my Martin chose Hillhead to fish, as I had heard some reports of some big catches there. I couldn’t get away until later that Saturday and in the back of my mind. I had a nagging doubt that Hillhead is quite a small venue and getting there late might not secure a good fishing spot. After a quick debate we decided to fish for bass at Chapmans pool instead. We had the beach to ourselves and with a flooding spring tide things looked good. Long story short! After using nearly £50 worth of peeler crab between us we never had a bite all night. Unless you count the small huss Martin had on sandeel!! As July heated up conditions looked good for a spot of sole fishing. Normally I fish Southbourne for sole. For a change in wanted to try another venue for sole. I spoke to some mates who suggested Swanage. As it normally throws up the odd good sole in July and August. With three rods set up with small two hook paternosters . I fished one in close, one at range and one somewhere in between. Another night spent fishless! Not a bite not an enquiry. Nothing! 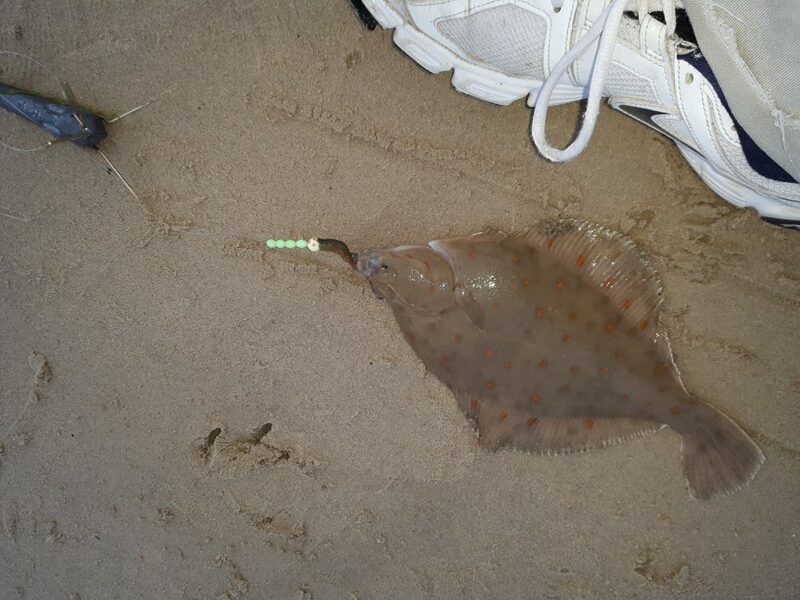 Last Friday I had a go at sandbanks fishing the spring tide with worm in hope of anything! With low water around 6pm I arrived at 9pm hoping to miss the worst of the tide and weed. By 10.30pm I still couldn’t hold bottom with a 6oz gripper weight. This was a bad omen and I prepared myself for another blank!! 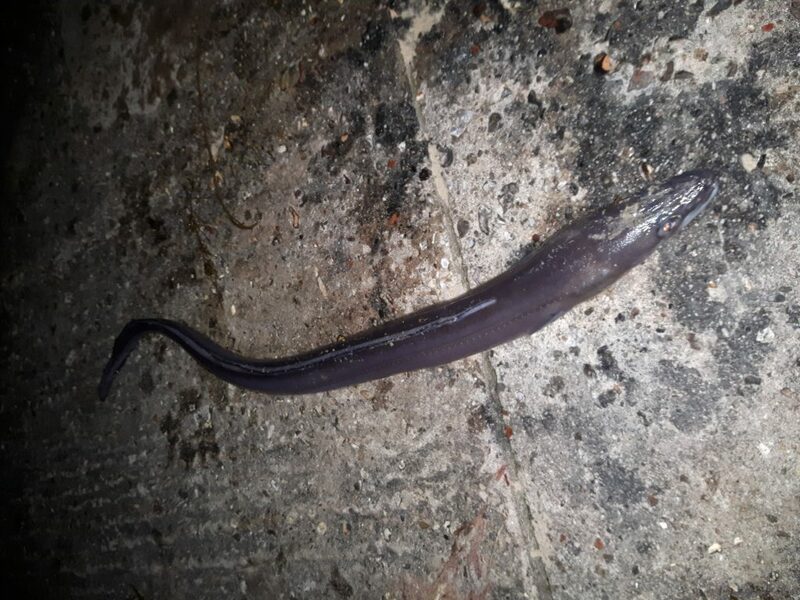 Surprisingly during the 10 minute slack water at midnight I hooked a small strap conger. Another first for me at sandbanks. Personally I would have preferred a plaice or a sole of the same weight. On the Saturday I took the family for a day out in our boat. We headed over Brownsea island and naturally I took a spinning rod and the worms left over from the night before, (Just in case we had a few drifts up and down the channel). We landed on the beach and the family took up their sun tanning positions. Not me, I set up the spinning rod up and fished off the back of the boat. Casting no more than 20 yards out. I had a small bass then another and another. 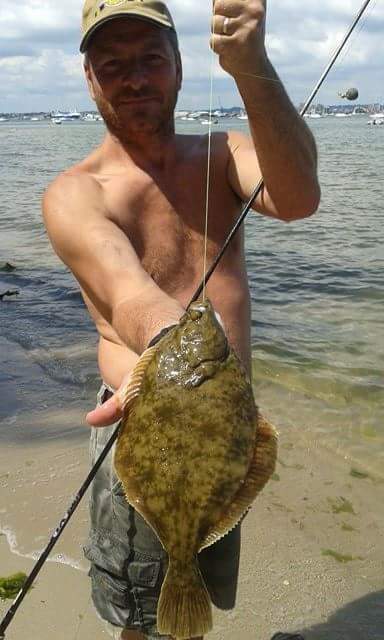 Then the rod rattled with a classic flounder bite. Reeling in I was happy to slide a plump summer flounder up the beach. It seems to me that boat fishing in the harbour is enjoying a bit of a renaissance. About 10 years ago I remember thinking how bad the fishing had become. Now it’s nice to see all manner of species being caught both in numbers and sizes too. Bass, plaice,bream black, red and Gilthead just a few that I have seen caught recently. Even the mackerel arrived at sandbanks this week. I met up with angling paI Shane Munford at around 6pm just in time to see big shoals busting up on the surface. Just out of casting range. I gave it an hour of spinning and went home fishless. 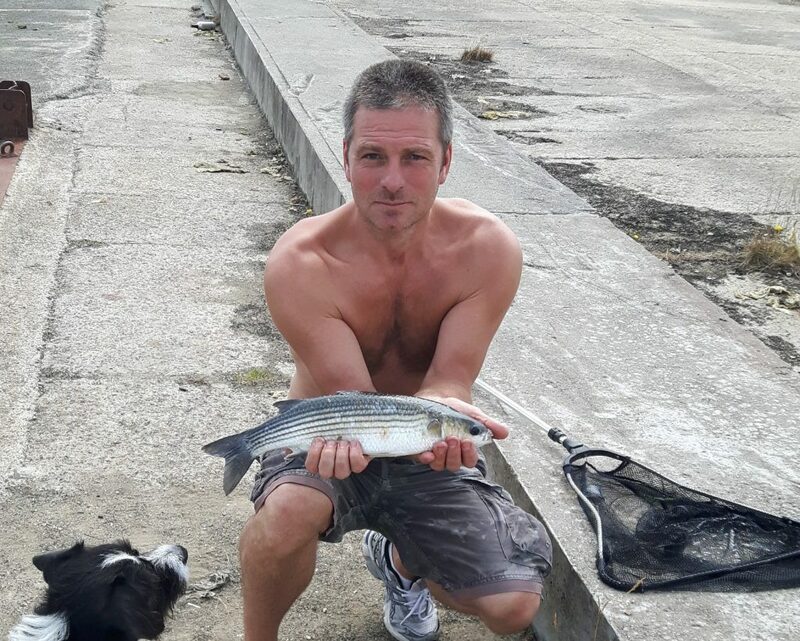 Only to be told by Shane that after I left, that the mackerel moved in at dusk and responsibly everyone had a good catch. This weekend I had my first crack at the mullet fishing this year. Pound for pound these fish are one of the hardest fighting fish I know. Fishing the old power station site I hoped that the fish would be hanging around the pontoons there. I wasn’t disappointed and within minutes of dropping my freelined bread over the edge of the quay. It was mobbed by several mullet up to 3lb greedily sucking at the bait. I was fishing only inches under the surface and you get to see everything. Watching as you see the part of the bait with the hook get closer and closer to its target. It’s heart stopping stuff. Unfortunately at times if you hook one in a shoal. It spooks the rest. Sometimes a move further down the quayside can find a new pod of fish. Unfortunately this was not the case this time and I never even seen another mullet after catching that first fish. I gave it a few hours but was happy with the scrap I’d had earlier. August looks to be as good. With all the local marks fishing well. Hopefully the weather will play ball too. 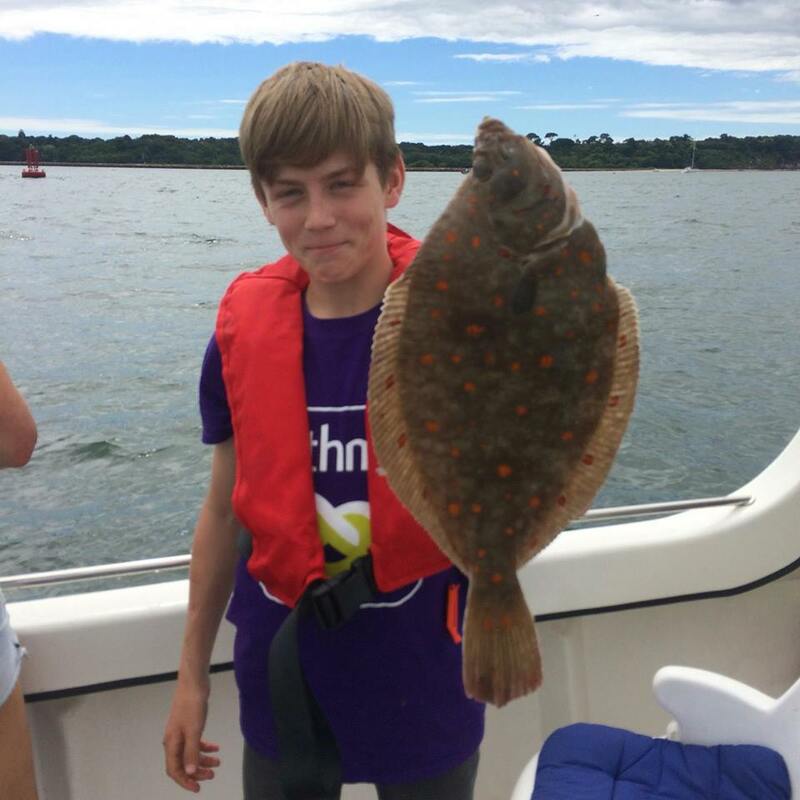 One Response to "Summer fishing report from the Poole area"